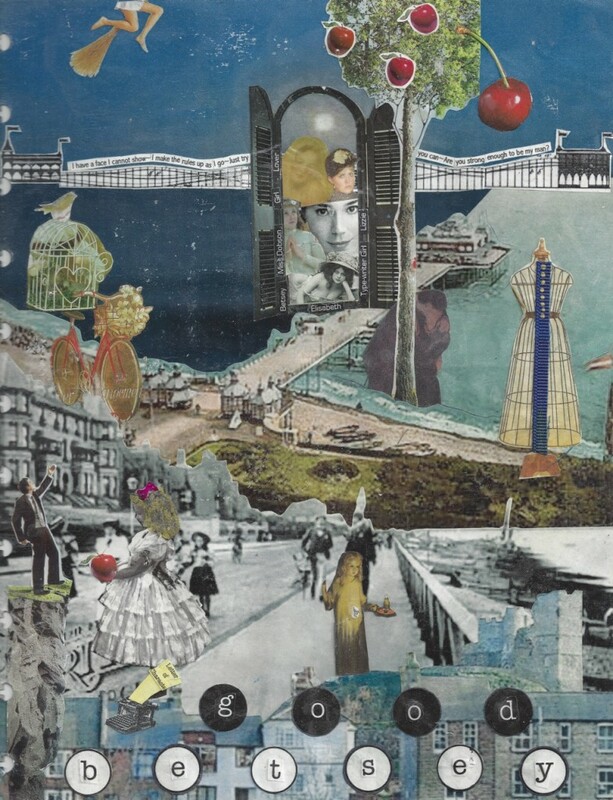 As an Argh Ink reader, I’d admired the book collages Jennifer Crusie posted there, but resisted doing one myself. After all, I’d had a rather stressful experience at one of those scrapbook home sales parties. At the end of the evening, everyone else had orders placed and cute layouts all done, while I had an archipelago of loose photos and scrap paper strewn across the host’s coffee table because I couldn’t give myself permission to take shortcuts with pre-made templates. Thus, a book collage seemed like something that would cost me writing time rather than make me more productive. But then I ended up in one of Jenny’s collage workshops, and that’s where the collage you see here happened. Sort of. What I made at first was so rough that I almost didn’t bother to lug it home. I made it mainly in the community spirit of the workshop, and with a reminder to myself that with the time and tools available, I wouldn’t be able to make it “perfect.” In other words, I gave myself permission to have fun and make something ugly. In other-other words, my inner critic was not invited. I rebuilt the collage as I was rebuilding the story in a revision. I remember thinking at one point, “This doesn’t have everything from the book yet, but it feels done.” Hm. I quit working on it. That turned out to be what I like about this collage: the heart of the story is in it. After a substantial rewrite for my agent, I looked back at it and realized that for all the axing and adding, rearranging and recasting, every single thing represented in the collage was still in the story. Two common questions I get about it: What does “GOOD BETSEY” mean? and Did the cover artist use it? 2) I have no idea. I don’t think so. I sent the collage along in a batch of other pictures, but there’s nothing to suggest it inspired the cover artist in any particular way. And The Typewriter Girl‘s cover is so lovely, I don’t think the artist needed any help from me. Storywonk podcast: authors Lani Diane Rich (Lucy March) and Alastair Stephens discuss collage for writers. Alison! That collage is GORGEOUS, and I remember that method when Jenny first posted it last year. Just beautiful! And your cover is amazing; the publisher REALLY did right by you. 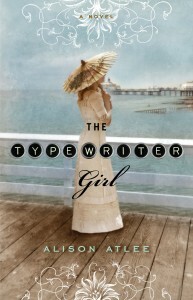 I have to say, I kind of loved “Good Betsey” as the title, but “The Typewriter Girl” is great, too. Congratulations! When you have time, can you share your note-taking method? Do you print all of it out, or do it in Curio or some other digital format? I’m really interested in that process, and would love to read more about how you do it. Beautiful, wonderful, lovely. Can’t wait to read the book! Thank you, Lani! I’m so excited you came by! Yes, I’ll write something up about my notes and let you know when it posts. I used Curio quite a bit for The Typewriter Girl. I’ve used it less since I discovered Scrivener, but it is so powerful for collecting images and web sources. That’s really lovely and so creative. All I’ve got to show for Summerset Abbey, is my monitor covered in post it notes! Oh, Teri, my desk and monitor are always a clutter of post it notes, too. How did writers survive before they came along? I’ve got Summerset Abbey in my TBR–it will be my treat when I get through the release madness. Looking forward to it! Elyse, it’s so kind of you to take the time to come let me know that! I’m delighted you enjoyed the book, and you certainly made my day!